I received some line pole information from Ian Millard and Colin Hussey in the comments from my last post and then received an email from Bob Stack of South Coast Rail with some very interesting documents. 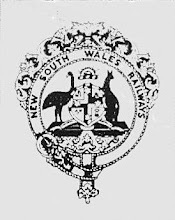 Bob's documents were two NSWGR documents and a plan which I have uploaded to Google Docs for you to download. These cover anything you might want to know but you will have to look for it particularly in document 2. For instance there are Sag Tables and I have found that the sag in between two poles spaced 40 yards (120') apart at a temperature of 70 degrees F is 6.3" for galvanised wire and 5.7" for copper wire. As my poles are approximately a scale 100' apart then the droop would be about 1.5mm actual. There are tables for spans of 40, 55 and 60 yard but because of our tight curves we need to space the poles a bit closer, I didn't know how far apart they were in reality so I spaced them to look right. Anyway, a big thank you Bob and everyone, have fun reading if you download them. Sorry that I opened a can of worms for you.You are right, to get equal sag over multiple lines would be extremely challenging. Frankly your first approach of invisible wires is the one I will continue to use. Not a problem, it had a good outcome as now everyone who reads the blog can get the necessary information and make their own decision as to how to model the line poles. All downloaded, & awaiting time away from the roundhouse construction, amongst other items tor read & go through. It goes to show that each little venture into new territory will bring out the relevant information. So a thank you Ray & to Bob for raising the subject & making the paperwork available. This has been a very interesting read & bucket loads of info, thanks for sharing Ray. Hopefully one of these years I'll be able to use it. Have I started something I might regret? Eugowra, a plan forms, and a New Year begins!